Today is the 2nd anniversary of the Government of Canada’s official apology to former students of Indian Residential Schools. To mark the date, Ottawa-based journalist Martha Troian sat down with one former student and heard her story of time spent at residential school, her reflections on the apology, and how she learned to forgive. She was only 8 years old when she travelled by boat to the Fort Albany Indian Residential School, along the west coast of James Bay in northern Ontario. She still remembers the nuns greeting the boat, ready to take the students inside. There she would join hundreds of other children from five surrounding communities. During her first year at Fort Albany, she remembers that she spent a lot of time crying, overwhelmed by feelings of loneliness. She says it was always worse after dinner, when it would further materialize that she would not be going home. 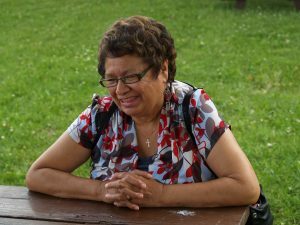 Meet Mary-Lou Iahtail, a 65-year-old mother, grandmother, and residential school survivor. Originally from the isolated community of Attawapiskat First Nation, located near James Bay, today she lives in Ottawa, Ontario. Before residential school, Mary-Lou lived on the trapline with her parents and six siblings. She has fond memories of returning there in the summer months, during breaks at school. They lived a traditional lifestyle that she says laid a foundation which got her through the later years. But every fall, Mary-Lou would climb back into the boat, and return to the nuns. Mary-Lou attended Fort Albany until grade 6, learning to read and write in English. But unlike some residential schools where students were punished for speaking Native languages, for the first two years she was instructed in Cree. The home economics class even involved cooking with traditional meat, like moose, rabbit, and partridge. Mary-Lou also learned a bit of French, something she enjoyed and would continue to learn later in life. That inability to read music lead to her knuckles being struck hard by a ruler. She says she lived in fear, crawling into bed each night knowing she would have to return to class the next morning. Not only did her father encourage her to continue school, he also wanted her to learn as many languages as she could. She says her father told her a time would come when those languages would come in handy. And they did. Now fluent in three languages; Cree, English and French, Mary-Lou has worked as a translator all across Canada. Following his advice even further, she earned a Bachelor of Education degree from McMaster University. On June 11, 2008 when Prime Minister Stephen Harper stood in the House of Commons and apologized to former students of Indian residential schools, Mary-Lou was there. That morning, when she met up with a friend and fellow survivor, she wasn’t sure what to expect. But as they listened to the Prime Minister’s words she found herself crying, overcome with emotion. All Mary-Lou says she remembers was hoping the apology was sincere. “There was a little hole in my heart, and I had to look after it”. Mary-Lou never used to speak about the bad things she experienced at residential school. That is, until she fell sick. She would endure cancer three times, depression and arthritis. But those sicknesses are what drove Mary-Lou to get counseling and finally begin talking about her experience at residential school. She says it’s helped her not to be so angry and most importantly, to heal. Work she continues to this day. “I’m told I’m doing very well, and I know I am. Because I feel confident about it”. Despite the bad experiences she had to overcome at residential school, Mary-Lou does not regret her time spent there. She is happy she made the most out of her education and continued to learn. Today at 65 years old, Mary-Lou wants to help people with their healing process. She firmly believes healing and one’s spirituality is the only way a person can move forward and forgive. Today, Mary-Lou Iahtail can say she is happy because she knows there is a way of forgiving. during her study time but practically out of her life completely. She’s describing it in such a way that children do carry a lot of anger inside when they get taken away from their parents. That anger she carried eventually turned into cancer and depression. And why Native people’s cultures, freedoms, languages, and their way of life tried to be taken away while every other culture remain with theirs. We have rights as human beings in this country of ours and more so. And we are very capable of making our own decisions what’s best for our children instead of causing fears, control, and enforcement. Leave our people alone and concentrate on your own families. Allow our children to be become good citizens, to have pride in themselves and to make better choices in their own time. “This is our life as much as you appreciate your own”.